Although the Web today is a vast reservoir of information, it is not (yet) infinite and many minor topics, along with people, organizations and other items of ephemeral or passing existence are completely missing or barely referenced. The latter characterizes what is currently available online regarding The Derby Grill at 19 Pearl Street. In fact, simply locating any trace of that specific address has proved difficult. The map above shows two buildings (boxed area) on Pearl Street in 1922 with addresses that range from 15 to 39. Those structures have since been demolished and the site is now occupied (if that's the word) by a parking lot. 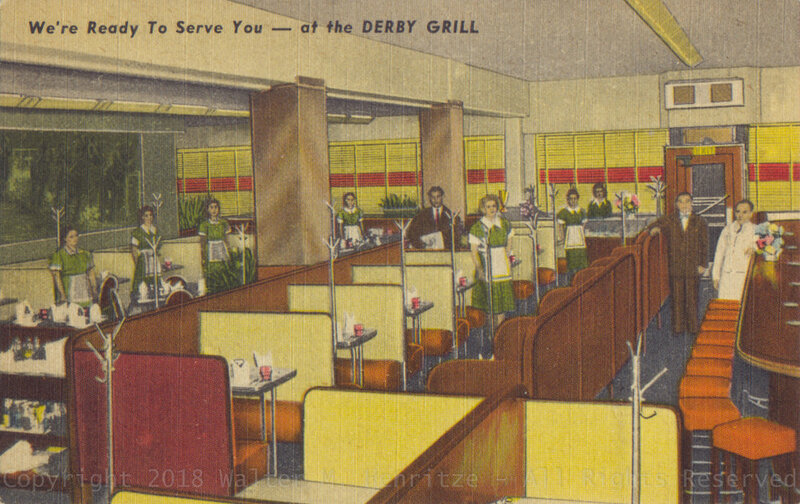 Based on the decor and clothing styles shown on the front of this card one would assume that some people with a living memory of The Derby Grill are still around. But, absent their testimony, the restaurant's original sales pitch will have to be the last word for now. The Downtown Restaurant You Like. for excellent food . . .
courteous service . . .
reasonable prices . . .
Who could wish for anything more? Older PostFranklin Square Theatre - F.L.C.